After climbing several flights of almost ladder-steep stairs, we arrive in the cheap seats at a lovely old Broadway playhouse. From this high up, you might think that all we would see is the top of Ian McKellen’s and Patrick Stewart’s heads as they create a new world for us on stage at the Cort Theatre. Everyone who walks through our door is important. Every person on our team is bringing unique gifts to the endeavour. But this is not the case and for one reason – the generosity of actors who remember to include even their lowest paying customers by playing to the back of the house. From the moment the curtain rises, we are caught up in the plight of these characters and when the actors take their bows, a thrill goes through me. 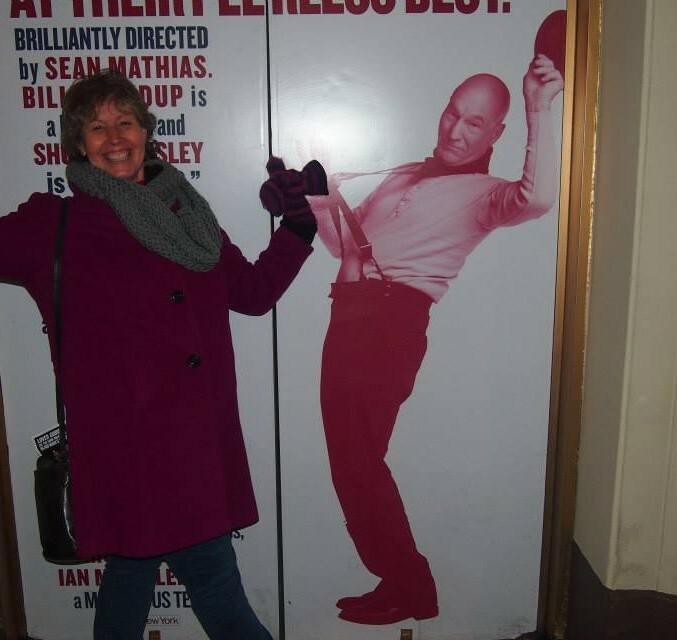 It feels like Patrick Stewart is looking up and smiling straight at me as he doffs his hat for a bow. Afterward, I reflect that none of us really accomplish anything on our own. Everyone who walks through our door is important. Every person working on our team is bringing their unique gifts to the endeavour. Watching two of my favourite actors perform had an unexpected effect on me. It humbled me to make a new resolution – to remember to play to the back of the house.